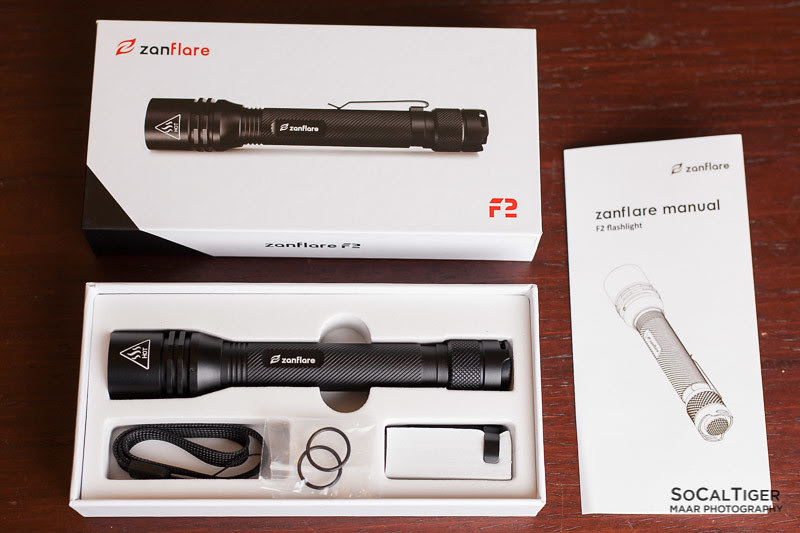 The Zanflare F2 and F2S are Gearbest's 2xAA flashlights under the Zanflare brand. 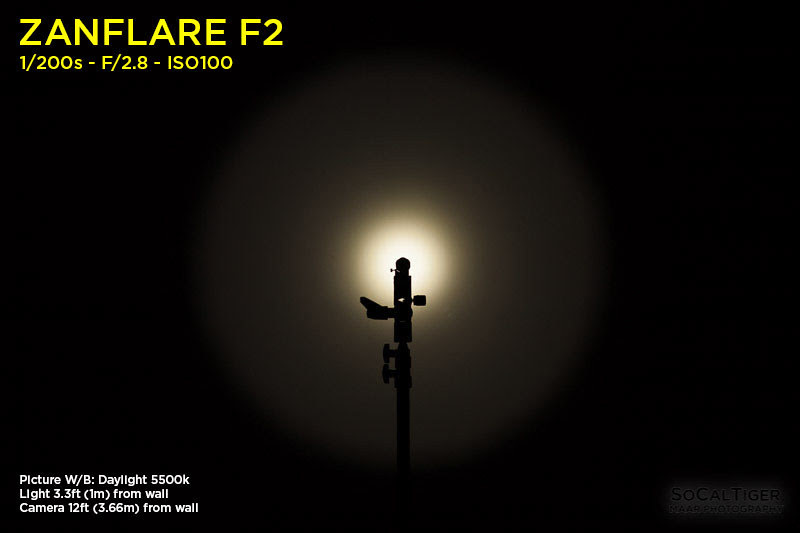 The F2 and F2S are 2xAA long tube lights which utilize a domed Cree XP-G2s in an OP reflector with a balanced throwy general purpose beam. 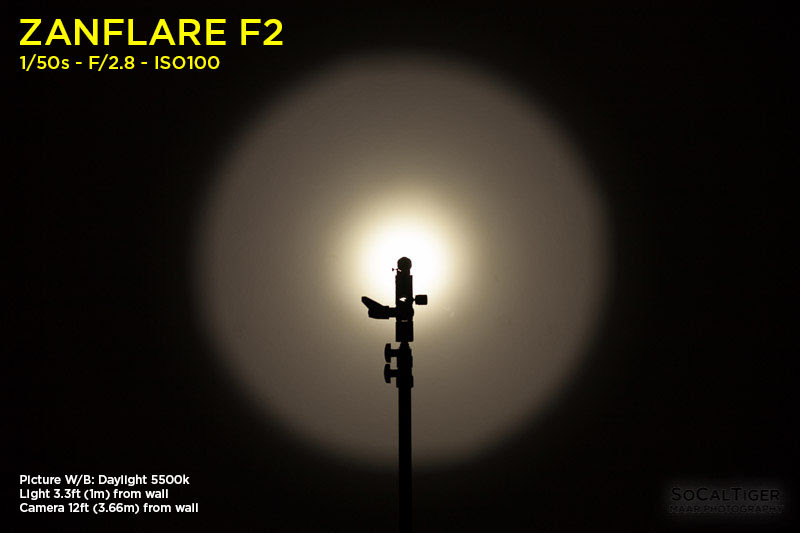 For the F2, output is speced at a max of 200 lumens (I estimate closer to 250+) on High. There is also a 15 lumen Low and 50 lumen Medium mode (I measured 21 and 66 respectively). The F2 comes from the factory with both Neutral White (4500-5000K) and Cool White (6500-7000K) options. I chose the Neutral White (4500-5000K) option. I was provided a copy for review by Zanflare. 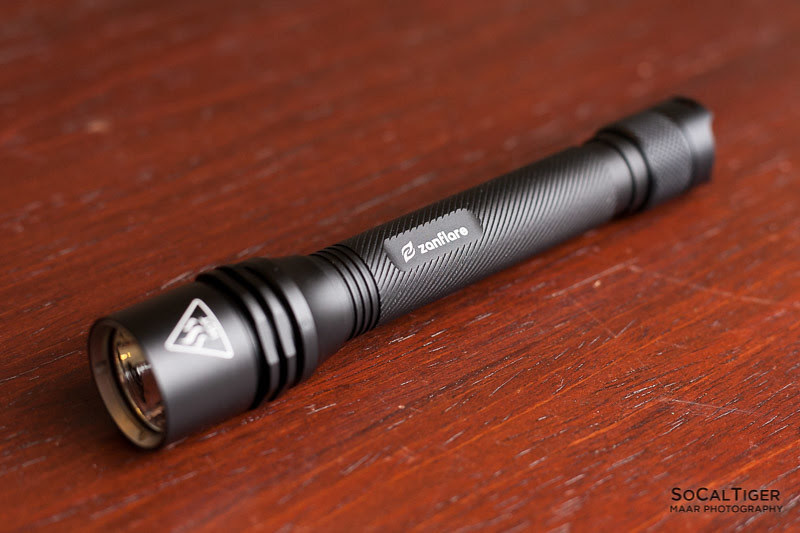 Machined from a solid aluminum bar give F2 its superior shock and impact resistance; All metal outer appearance and metal nut provide IPX-8 highest grade waterproof and weather two meters submersible adventure. "Crystal Coating Technology" combines "precision digital optics" to provide extremely high reflector performance; Toughened ultra transparent mineral glass and anti - reflective coating; Light weight, high strength aviation grade aluminum alloy, HA11l military grade hard anodized. when you turn on the flashlight, if the battery power is higher than 30%, the blue light will blink for 5 seconds, if between 30% and 10% a red light will blink for 5 seconds, when the power is less than 10%, the red light will flash. -When the battery is less than 10%, a red light will start flashing in order to warn the user to change the battery and avoid any possible damage. -If the user continues to use it without replacing the battery, the flashlight may flash abnormally and the user may fail to access to other modes. 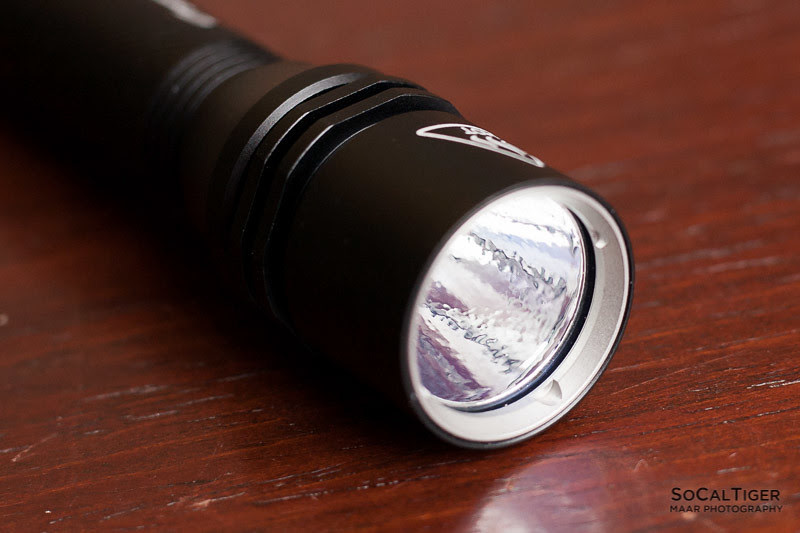 -The flashlight will turn off automatically only when the battery is completely discharged. 2. Once turned on, gently press the tail switch to switch between the four different modes: low - medium - high- strobe. The F2 arrived in a very nice retail-quality cardboard box and packaging. The light was cushioned in a form-fitting piece of white foam. Accessories included clip, 2 spare O-rings, lanyard, and manual. The packaging both looked very nice and protected the light perfectly. In addition, the box was inside a plastic bag to prevent the box from coming open accidentally as well as to keep the box in good condition. 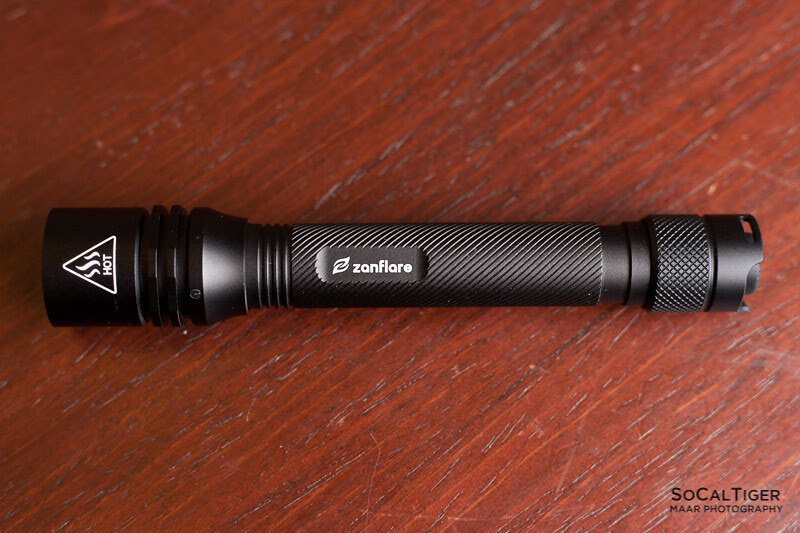 The F2 has solid and smooth black anodizing (Type III HA). The anodizing was applied well and seems thicker than many budget lights, even in the same price category. My copy did not have any notable defects in the finish. The anodizing was a smooth and non-glossy. I felt that this finish looks very nice and professional in quality. The body of the light is a 2xAA "long tube" design. The tube is noticeably thinner and longer than a 1x18650 tube. Due to the design, there is minimal roll-resistance unless the clip is attached. The body has a unique diagonal pattern which adds grip and a clean look, and some scratch resistance. The pattern is very smooth while still adding grip. It feels very very nice in hand. The threads were cut perfectly square and there is anodizing on the tail threads. 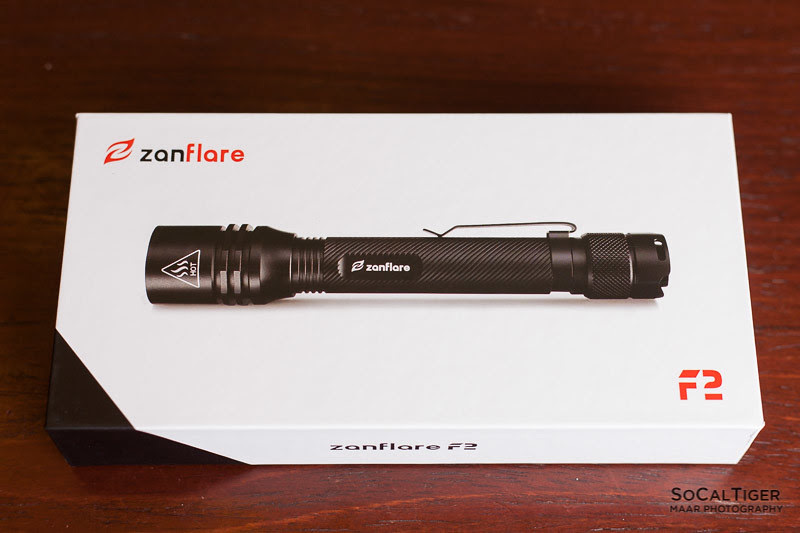 Comment: Like with the Zanflare F1, I originally wasn't sure whether or not I would like the diagonal pattern on the grip based on pictures. However, in person, the pattern is very nice and in fact I think that it works a lot better in hand than the traditional knurling on most lights. It's able to add grip while feeling smooth. The lanyard was nice and the perfect length on mine. The clip is nice material. However, I would have liked a deep carry clip and the clip seems short compared to the length of the tube. The F2 cannot tail-stand because the button on the tail protrudes. The light has a rear reverse-clicky (On/Off) and uses a half-presses to control modes. Comments: I dislike the "forced" strobe and wish that there was a way to turn it off. Measurements were done using a freshly charged 2450mAh NiMH. I estimate that the Zanflare F2 performs better than official specs. My measured runtime on High was 75 minutes (1.25h). The official runtime stated for High is much lower than reality. I did not detect PWM via video method. If it has PWM, it is very high frequency. 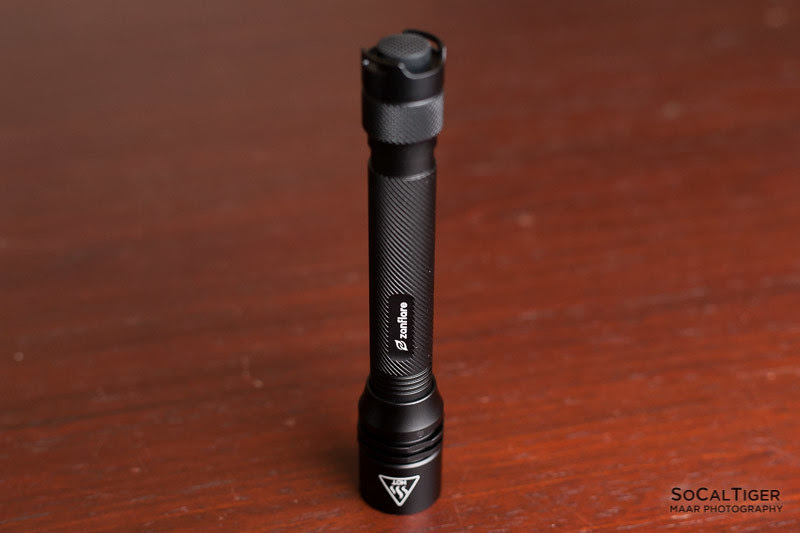 Starting from High, this light will hold an output of over 200 lumens for about 150 minutes. In my case, right at about the 150 minute mark, the output dropped from 200 to 100 lumens over the course of ~2 minutes. After that, it immediately dropped down to just 2 lumens. I call this a "vampire mode". It will run at 2 lumens indefinitely until the batteries are completely drained. 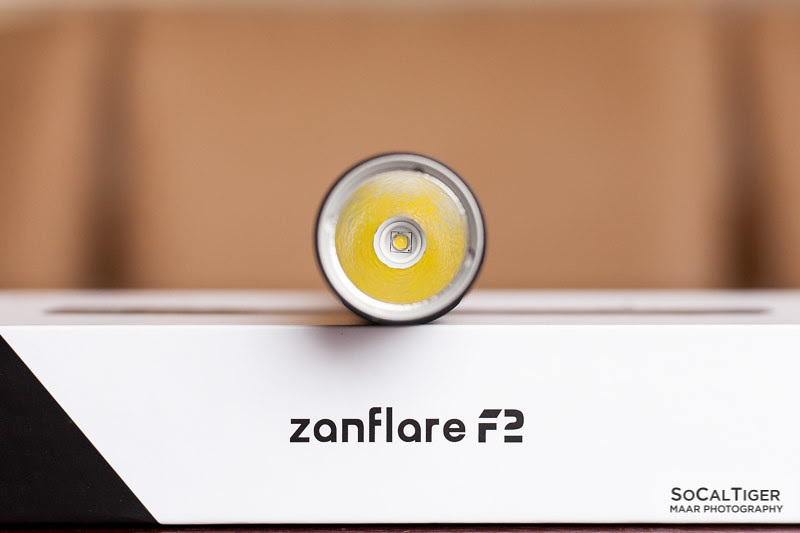 The Zanflare F2 was originally speced to use the XP-G3. However, the initial production run uses the XP-G2. Zanflare has stated that they may do a run with the XP-G3 in the future if there is enough demand. The manual that was provided with mine still states XP-G3 in error. Throwy but Balanced. 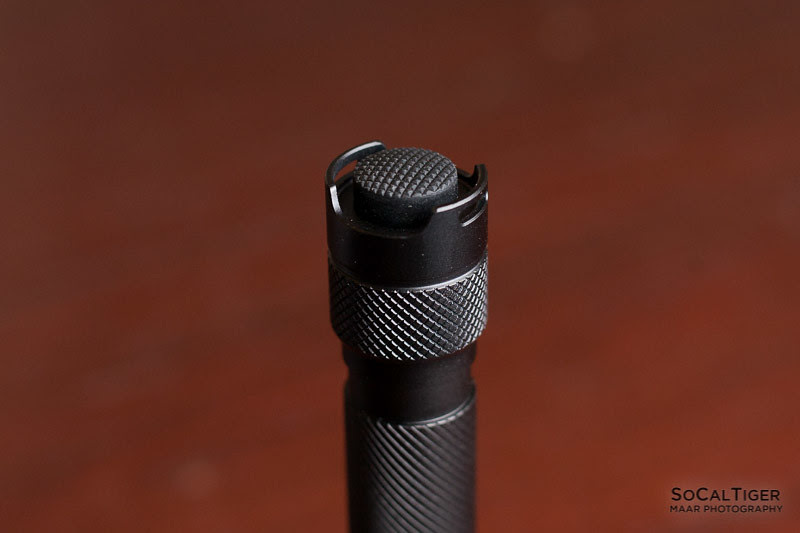 The F2 uses a domed Cree XP-G2 in an OP reflector. The beam is throwy but balanced. The hotspot size is average. The beam has smooth defined edges. This light works very well for people who want some throw but also enough spill for general work. The F2 "Neutral White" is a very nice warm neutral white at 4700K. 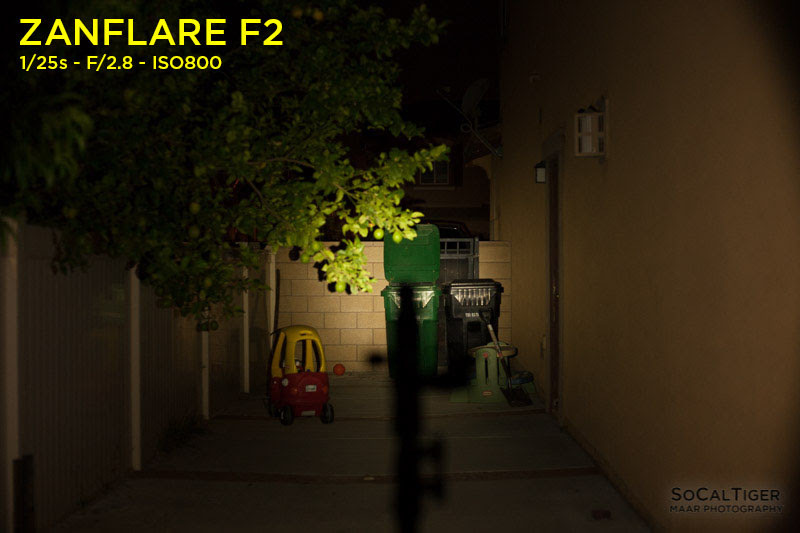 When white-balanced in Adobe Lightroom against "Daylight 5500K", the beamshots appear slightly warm to neutral. The light appears slightly warm white in practice. This is a very good choice of color temperature and I'm really happy to see a manufacturer using this color temperature for a light. 2450mAh Eneloops or Equivalent Batteries Fit. Tested using IKEA LADDA 2450s. You can physically lock-out the light by loosening the tail slightly to break the circuit. If there is a possibility of accidental activation, you can lock-out the light. 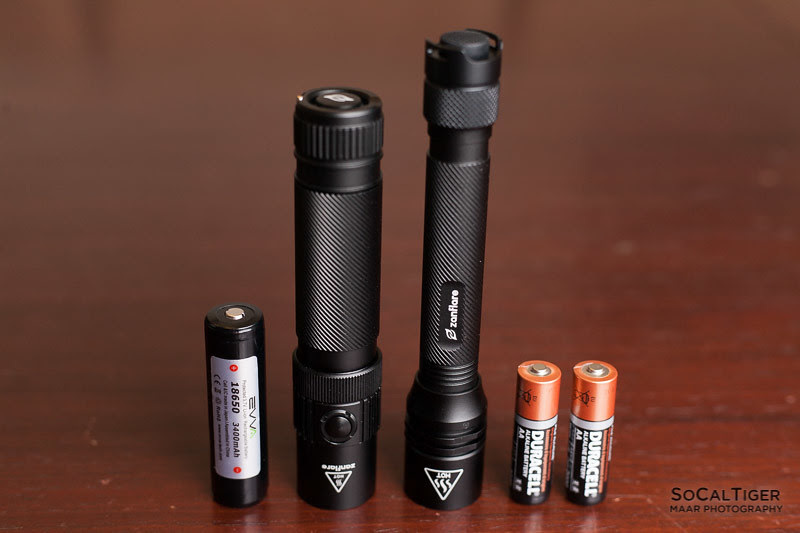 Flashlight pictured next to AAs, 18650 and Zanflare F1 for size reference. This is a really nice 2xAA light to keep around the house. 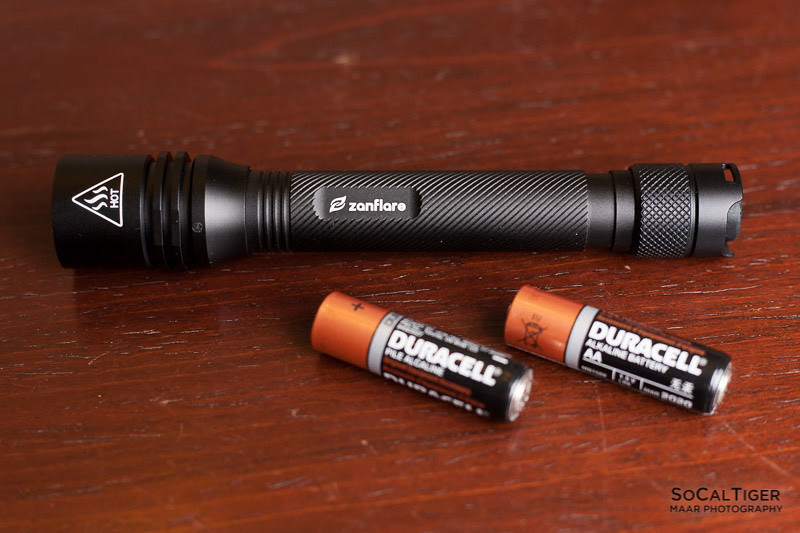 The AA battery format is very accessible and can be handled by anyone. I am now keeping this light as a bedside light (as I'm paranoid about having a Li-ion light next to my bed). 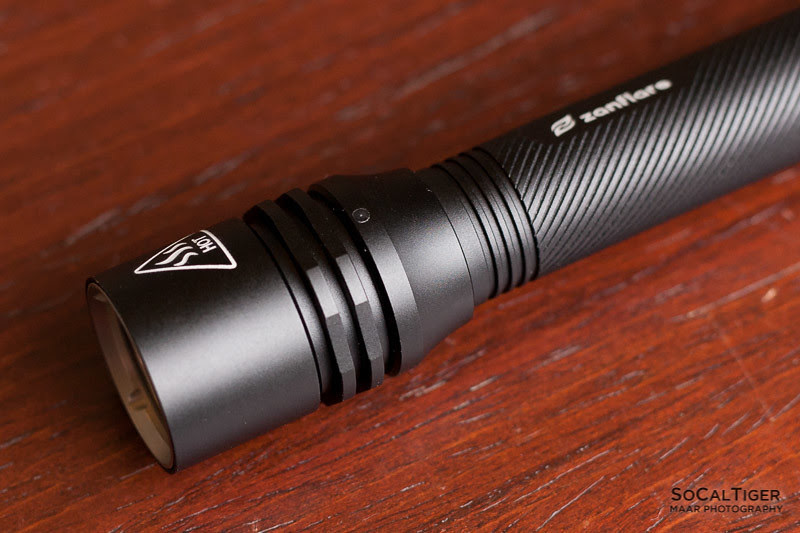 This light is nice and well-built and performs at spec at 250+ lumens on High. The light is easily capable of sustained run-times on High (see run-time graph). I recommend a light like this for people looking something that runs well on AAs and provides a usable (but not blinding) amount of light. This size light is a "long tube" 2xAA design. It is thin enough to fit in a pocket but only if the pocket is deep enough (or you are okay with it sticking out a bit). The finish looks excellent, is clean and my copy had no defects. 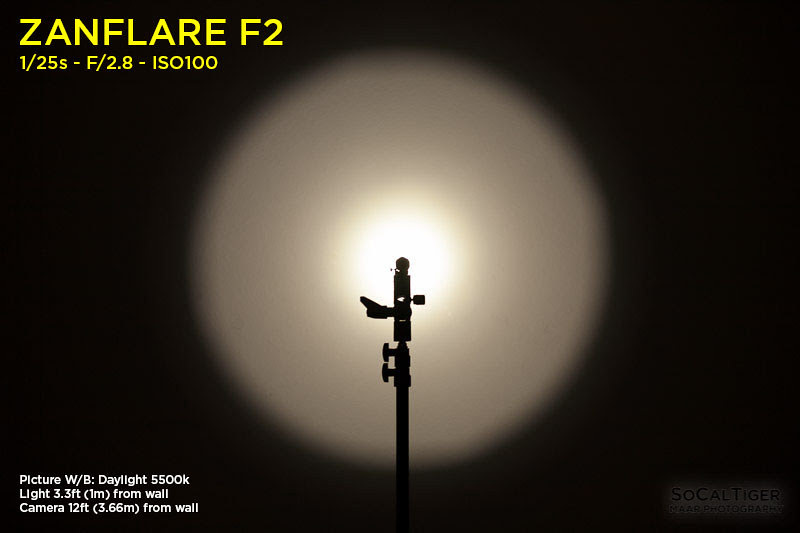 The beam profile is very balanced and is well-suited for general usage. My copy was a very pleasant 4700K color temperature (warm neutral). I like the trend of manufacturers offering "neutral white" lights in this color temperature range. Just got mine delivered this afternoon, also in neutral. Noticed it does have mode memory which is a very nice feature. 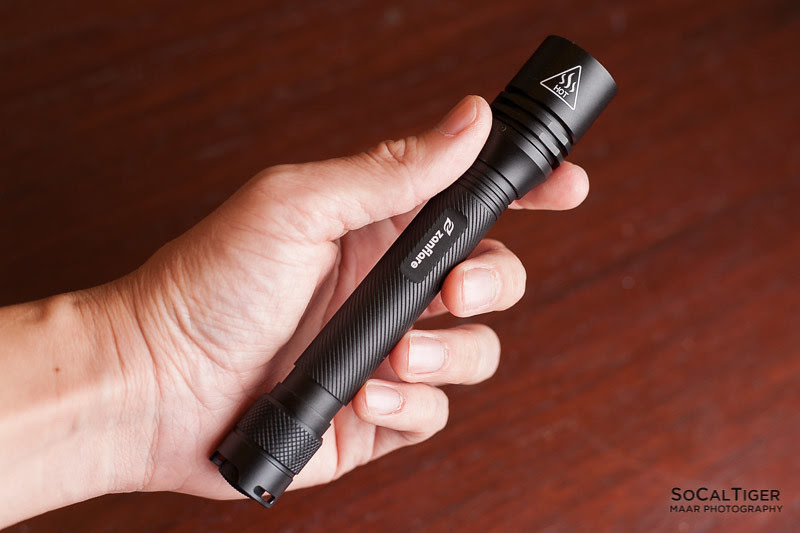 Great flashlight for the money. Thanks for the beam shots and measurements. Hmm… I wonder why the significant difference in runtime between your sample and mine?? Mine ran for 100 minutes before dropping down to vampire mode. And I was using standard Eneloops (1900-2000 mAh capacity). 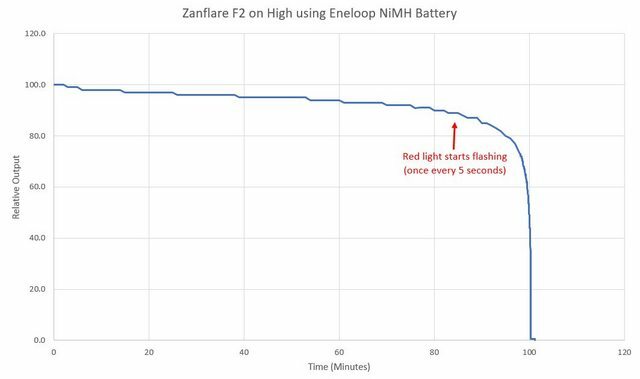 So my Zanflare F2 sample got 33% longer runtime with batteries that have 20% less capacity! Either your batteries were not fully charged, or your sample is drawing more current on high (which should also mean it is brighter on high). I measured the tailcap current at 1040 mA with fully charged batteries. The runtime of 100 minutes I got is fairly close to what I would calculate based on current draw and battery capacity. Did you measure the tailcap current on your sample? Hmm... I wonder why the significant difference in runtime between your sample and mine?? Mine ran for 100 minutes before dropping down to vampire mode. And I was using standard Eneloops (1900-2000 mAh capacity). 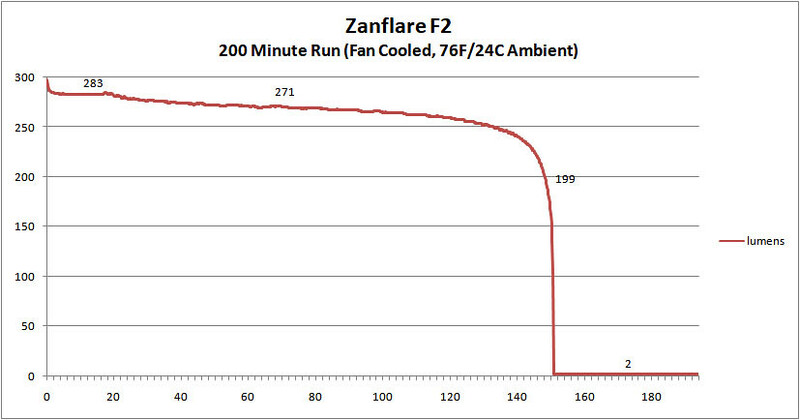 So my Zanflare F2 sample got *33% longer runtime with batteries that have 20% less capacity! * Either your batteries were not fully charged, or your sample is drawing more current on high (which should also mean it is brighter on high). I measured the tailcap current at 1040 mA with fully charged batteries. The runtime of 100 minutes I got is fairly close to what I would calculate based on current draw and battery capacity. Did you measure the tailcap current on your sample? !http://i.imgur.com/n0OYtdDl.jpg! OMG so sorry you guys but I made a huge mistake with my runtime graph. I ran this flashlight much longer than normal since there were questions about the published runtime for this flashlight. However, when I generated the graph, I forgot to change the calculation factor for the timescale correctly so the runtime is actually double what I originally stated. This light will run on high for 150 minutes (not 75 minutes). I ran this test between 6:30pm and 9:49pm (200 minutes). Apologies to anyone who was confused by this and also for the fact that this makes a huge difference in the measured runtime, I regret that this didn't even occur to me as I was publishing the data and writing the review. I have corrected the above review. I measured 0.97A at the tail on High. Does it have different performance (in brightness) between eneloops vs other batteries? Very nice review, thanks! Does it have different performance (in brightness) between eneloops vs other batteries? Not sure – I haven’t tested it using different batteries or battery types. I’ve only used the IKEA LADDA 2450mAh batteries for measurements which should be equivalent to the Eneloop Pros. I’m waiting mine to arrive and will test it myself. I was just wondering. My F2 just arrived. 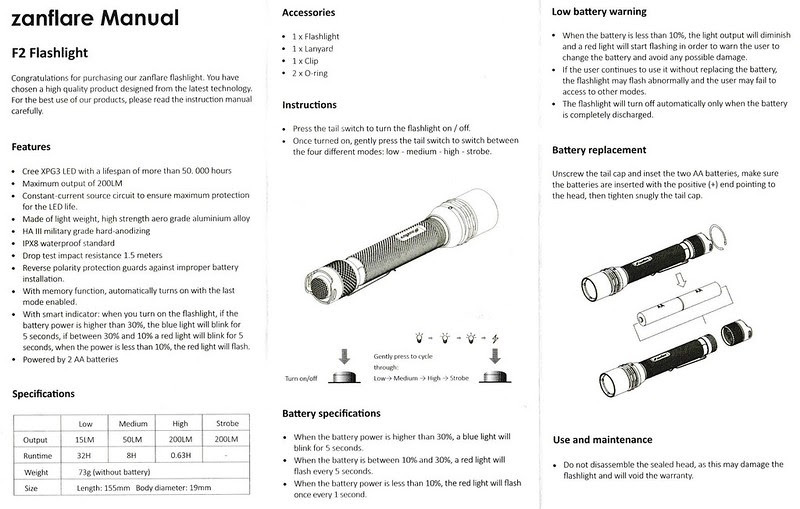 Everything is fine in this flashlight: price, build quality, lightning performance, tin. For sure will buy another one for me and some for gifts. What is the difference between the F2 and F2S? It would be nice if you included links to the reviews of the light that you took the comments from. For review, you can just search and easy to find. Could anyone confirm if this light could take Energizer Lithium primaries? With cells in series, the most significant risk is if the cells are not matched. 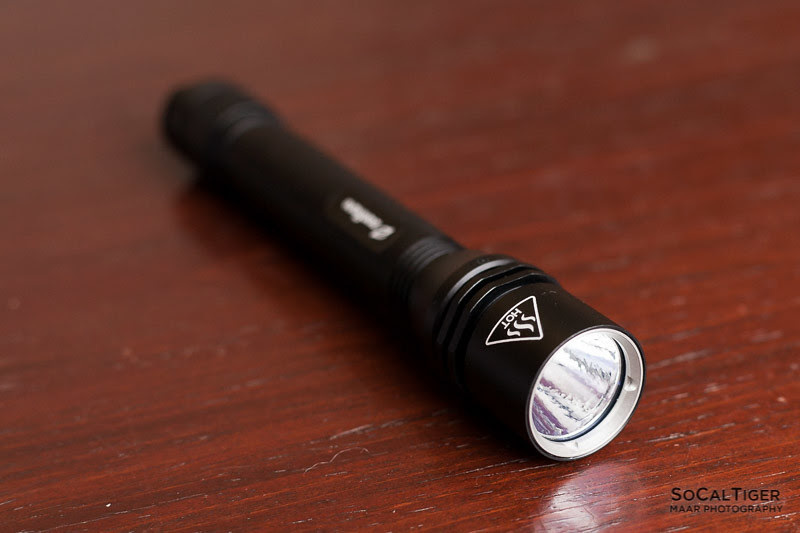 In that scenario, people have been severely and irreversibly been harmed by lithium primaries in flashlights and you should be very concerned about avoiding this. Aside from that the question would be whether or not lithium primaries would be safe to use for the given current draw. Price with coupons can go as low as $9.99. For that kind of money it’s one of the best options out there. Mine stopped working , anyone else had any issues? Zanflair sent me to GB. I sent an email to GB weeks ago and they didn’t respond. 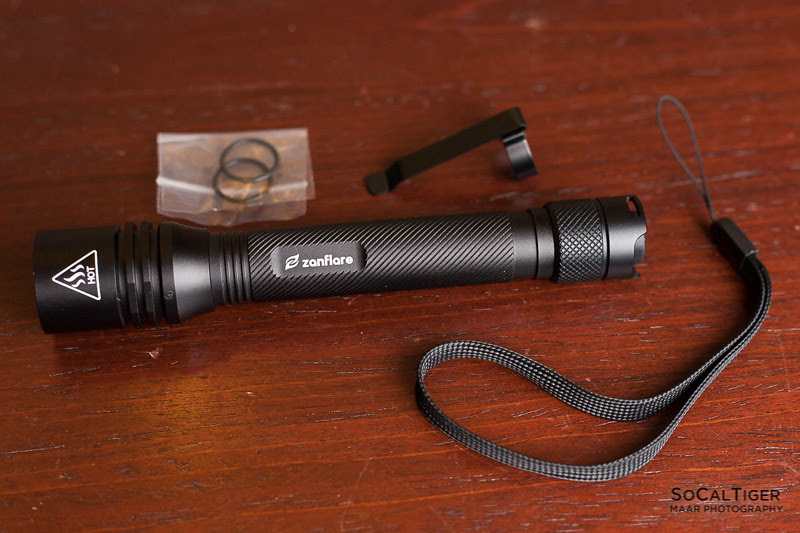 Coincidentally I found this light on Gearbest while looking at something else, ordered it this morning. It just looked really nice and the specs told me it’d be a great little double AA light for my son or whatever. I reviewed the F1 and found it to be a solid performer, sent it to Houston with some folks helping out in the rebuilding process down there after Harvey.